Dating back to 1715, Long Meadow is the oldest property on the farm and was once used as a milking parlour. 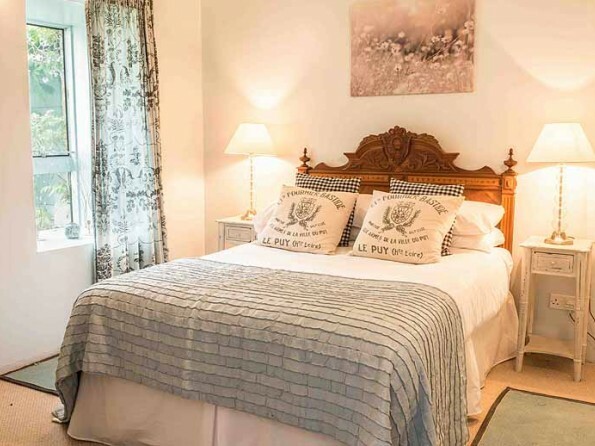 Now beautifully restored, it is a luxurious cottage with traditional clunch walls, an elegant but relaxed French country feel, and a unique character. 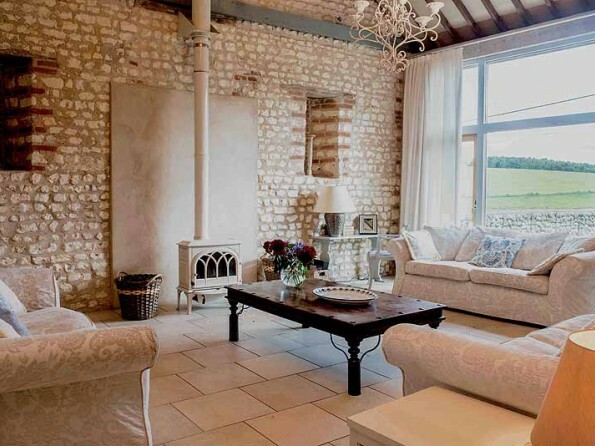 Long Meadow is one of five historic farm buildings to have been restored by an architect and his wife, and it is now a beautifully-appointed cottage for 8 people. It has a large oak-beamed sitting room with views across the courtyard garden to the lovely Stiffkey valley beyond, and there is also a generously sized dining room with a huge window looking onto the terrace (the perfect spot for al fresco meals). The space, layout and spectacular views make it a perfect place to relax with friends and family, and designer details combine with traditional building techniques to create a rustic yet contemporary holiday house. 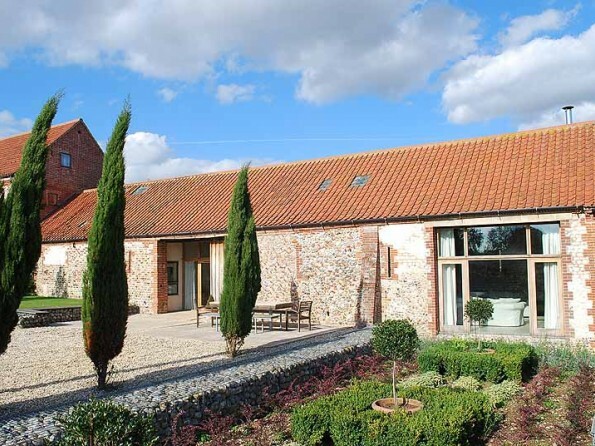 North Barsham is a 15 minute drive from the Norfolk Coast and is very handy for trips to Blakeney, Wells-next-the-Sea and Burnham Market. There are beautiful beaches at Holkham, Hunstanton and Sheringham (to name but a few) and there are lots of opportunities for sailing, windsurfing, kite surfing, fishing and wildlife watching. 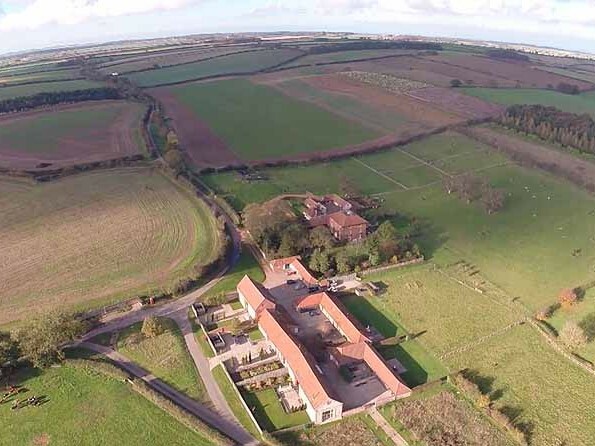 There are excellent walking routes near the barns, cycle hire and riding stables are readily available, and there are some superb golf courses at Sheringham, Brancaster and Hunstanton. Take a day trip to Holt Country Park, the Hilltop Outdoor Centre and Foxley Wood or visit the wonderful historic houses and scenic gardens of Blickling Hall, Sandringham House, Houghton Hall and Castle Rising. And you can keep children entertained with crabbing, Go Ape, the North Norfolk Railway and outings to Banham Zoo and the Sea Life Sanctuary at Hunstanton. And don’t forget to sample some of the delicious delis and excellent pubs and restaurants. 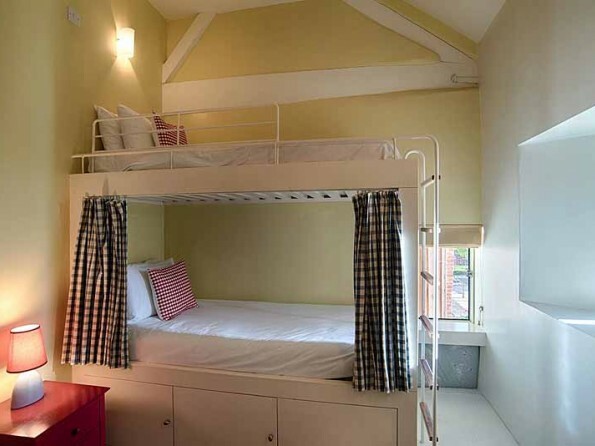 The barn has four bedrooms – one king size (can be split into twin beds), two double and one twin. 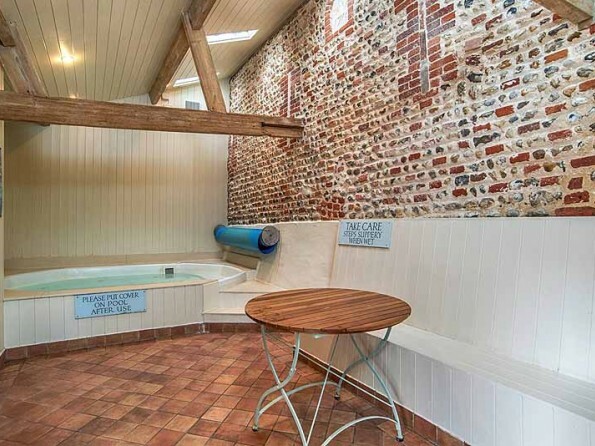 Two of the rooms have en-suite shower rooms, the other two rooms share an en-suite bath via jack/jill door, and there is also an additional WC. 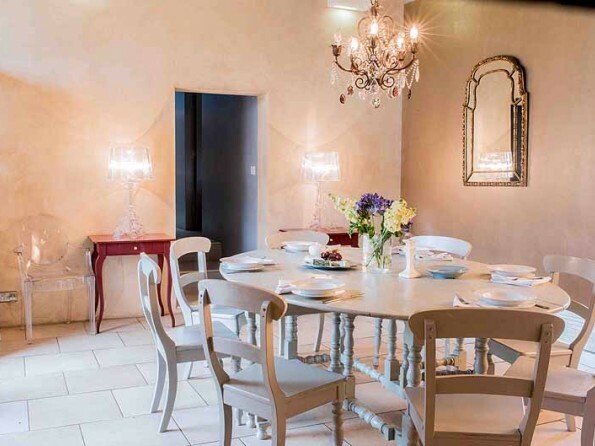 The galley kitchen is very well equipped and is open to the dining room/sitting room so you can chat while preparing meals and the dining room has an elegant oval wooden table seating eight, an antique crystal chandelier and a gilt mirror. 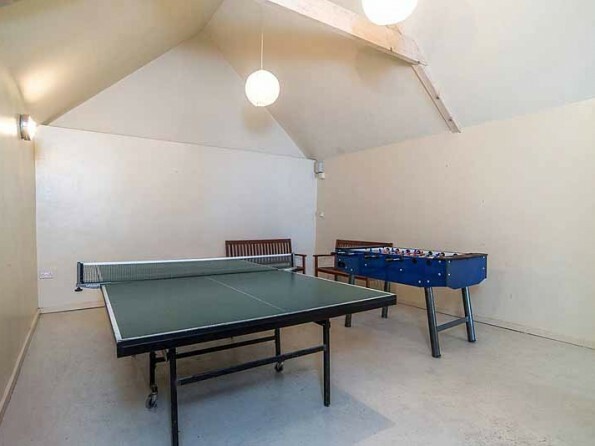 The barn is kitted out with terrestrial TV with Freeview, a DVD player, a radio and a CD System, free wireless internet access is available, and there are two games rooms, one with table tennis, and one with table football. Outside you will find a large terrace with a table that seats 8, a BBQ, parking, and a south-facing courtyard garden with a sunken Mediterranean bed filled with lavender, box and olive trees. You can also book a session for exclusive access to the spa pool on site where there is a Jacuzzi and a steam room. On arrival you will be provided with flowers and a welcome tea tray including tea, milk, sugar and local Norfolk biscuits or cake. Catering is available. 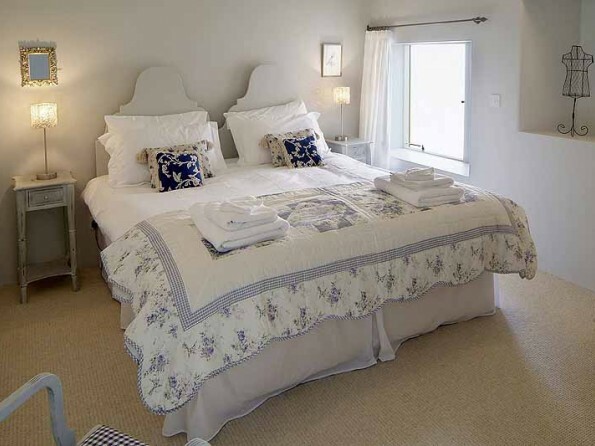 There are four other properties available on the same site which is ideal if you’re visiting in a larger group. 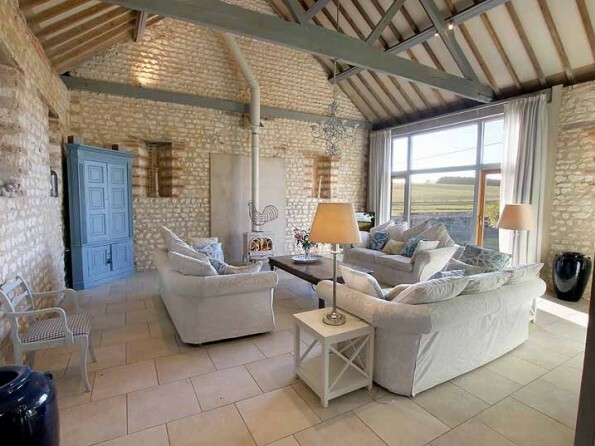 The Great East Barn is a restored granary which sleeps 14, High Barsham is a renovated threshing barn which offers accommodation for 12, Grey’s Court is a stable conversion sleeping 10, and Little Barsham is a cottage which sleeps 4. 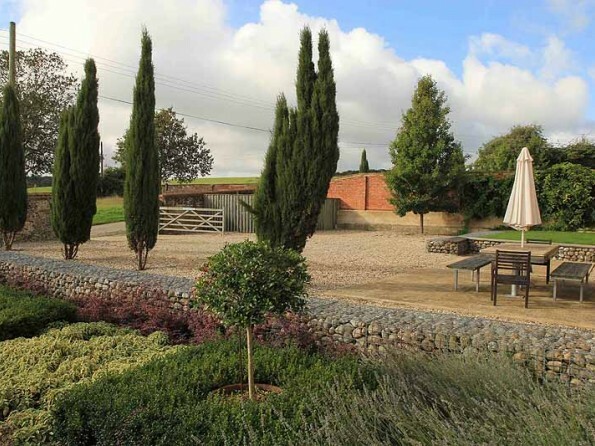 The site is ideal for business meetings, team building events and weddings. We also offer yoga breaks and residential creative writing courses throughout the year. Please inquire for more details. Linen is provided. Children are welcome, and the barn is suitable for the elderly but not for wheelchairs. Sorry - no pets allowed and no smokers. Changeover day for 7 night bookings is Friday. 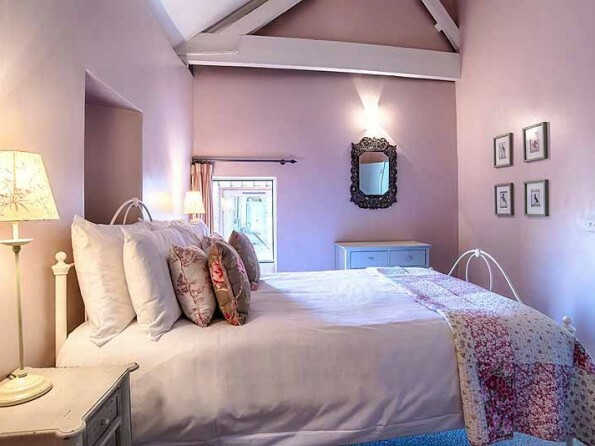 Weekend stays are 3 nights from Friday and mid-week stays are available from Monday or Tuesday for 3 or 4 nights. A deposit of one third of the rental fee is payable and the balance shall be payable 8 weeks before the commencement of the rental. Rentals commence at 4pm on day of arrival and terminate at 10am on the day of departure.